Fancy winning a hard back copy of the fantastic new official Elite: Dangerous novel Elite: Legacy signed by the author? For your chance to win you need to write a Drabble (a 100 word story – not including the title) featuring in some way Lave Station. There are no rules for content or cannon, be as creative as you like. Maximum of 3 entries per contestant. Drabbles will be read out by our own Grant “Psykokow! on the “Abrakadrabble Show” after the competition closes. Competition will close on Sunday the 15th of February with the winner being announced shortly after. Post your entry as a comment on this page, or send them direct to info@laveradio.com. 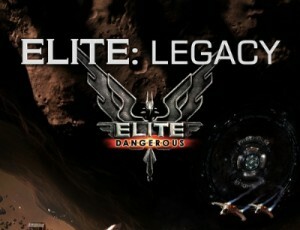 Competition, Elite Legacy, Fiction, Michael Brookes. Bookmark. Cmdr Winnard parked up outside lave station to listen to the latest lave radio, he was all excited he hadn’t slept in months, soon the dulcet tones of the radio presenters came over the airwaves, apparently one of them had graduated to big boy pants this month and Cmdr Winnard wanted to know which one of the presenters had managed it. He struggled through the introductions trying hard to keep his eyes open and his ears listening, it was no use the repetivity of the subjects had lulled him off to sleep again, He never would find out who graduated…. It had been thirty years. Thirty years since he first picked up his Pilot’s license and left to seek his fortune. So many stories bridged that time and now, adventures without number out in the vast, empty spaces beyond. The tedium of the long hauls, the terror and excitement of combat, the fear as atmosphere vented to vacuum, the jubilation of triumph. The Cobra’s controls were worn with time and use, but they still responded as well as they ever had. He opened a channel, made his final course corrections. Slowly, Lave Station swam into view. Home. They try, and fail, to explain how big space is. But what nobody talks about is the time that gets lost. With no night and no day, no melt and no frost; unnoticed, the years slip away and sense of distance dissolved. Owena travelled far for her bounties. Sins of frontier pirates now absolved, she braved thousands of light-years, and kissed a hundred stars. She longed for clean air and gravity; a place she could rest her mind and fears. She had returned to her true home; her people, her nation. The landing gear lowered, finally docking at Lave Station. ‘Great’, she thought as he heard the laugh of the pirate over his Comms. Muting the coms and she eyed the cool down time of his FSD. 10 seconds. The hauler shook violently as it was riddled by the by the pirate’s guns. The pilot hit the afterburner and threw the ship into a violent roll while she quickly disabled the flight assist. She heard the ship groan as it spun and flew forward at top speed. With all power diverted to the systems she watched a halo of rounds whizz by his canopy. She hit the jump button and held her breath as she was the drive bar fill in the hub. The hauler took a second hit, and saw that the hull was down to 45%. She started to wonder if removing the shield battery to add a 3rd cargo rack was the best idea. Then she saw the beautiful blue of the cruise speed, and quickly selected the closest station. She jammed on the throttle and swung the hauler into a intercept. To be eligible your drabble needs to be 100 words in length, at my calculation you currently have 185. Lave Station’s comms panel lit up: **PRIORITY TRAFFIC** flashed onscreen, angry and red. Space outside the station boiled and seethed. Strange, alien shapes began to emerge from the depths. Like a herald of death, the wreckage of the Daedalus floated on before them. Drifting slowly Carl matched his ships rotation to that of Lave station, he had done this thousands of times before. His mind drifted off with thoughts of the shiny new cobra that was waiting for him after this run of rares, it had been a hard grind to get to the half million credits but it would all be worth it for a grade A cobra. No multiple jumps, wasted time Suddenly alarms sound and a “Trespass Warning” flashes on the screen the 15 second timer starts counting down, pulling back and firing boosters, 2, 1 lasers flash, ship disintegrates. The Alliance representative on the other end of the handset remonstrated. The response was firm. The line went dead. The blue halo fades as the viper emerges from supercuise. Ahead lies the light studded geometric shape of Lave Station. Outside a dozen ships are coming and going. Normal business for a busy station, but the pilot is looking for something else. It takes a few moments to find the innocuous sidewinder hanging motionless near the bulk of the station. The pilot can’t tell from this range but he know instinctively that it’ll be orange. The pilot checks the time. Five minutes until the show starts. He guns the viper’s engines and deploys the hardpoints. There’s no time to waste. Stuck in sub-light speed! He had almost reached Lave when his FSD failed. Now he was getting a stern reminder about how big was outer space. Sometimes “do-able” is worse than “hopeless”. He had the resources to make the eight week crawl, but the computer glitch that had taken out his drive had also wiped all his media files. It was going to be a long boring trip. His comms could still take incoming calls. He flicked a switch and heard “You’re listening to L-L-Lave Radio: the hottest station this side of Diso…” He winced and flicked the switch off. Captain Seamus Young signed the paperwork from Faulcon deLacy, accepting the final shipment of Viper Mk IIIs into the Lave Station Authority. Beautiful, heavily armored, and more deadly with two extra hardpoints, the newest model was a marked improvement over the Mk IIs. The following day he oversaw the decommissioning of the final Mk IIs. “On this 5th day of the seventh month of 3288, we bid a fond farewell to the last of our old fleet,” he said as the station opened fire and tore the four to pieces. Hidden in dock was the fifth. A present to himself. Your entry is actually 101 words long. Or if “End of an Era” is your title, then it’s only 97. Unfortunately it has to be 100 on the dot, excluding a title if you choose to give it one. You have until later this evening to submit an edit, otherwise I’m afraid I cannot submit your entry for judging. It’s the periods in the Mk.IIIs and MK.IIs causing the issue. http://www.wordcounter.net/ picks them up as two words (the Mk and the II bit’s separately) while Word sees them as single words. Alright, I’ll allow it. However, I’ve removed the unconventional punctuation from the submission. It’s still something people need to be mindful of IMO. The sound of the strings raced as he pulled back on his stick. The magnificent vista of the rotating Lave Station inched down into view as the familiar strains of “The Blue Danube” played. With flight assist off, he tapped his stick right to match angular velocity. The strident waltz was the perfect accompaniment for the spectacle of approaching such a grandiose floating cathedral. The dancing strings were abruptly replaced by a warning klaxon as he dunted the nose of his Eagle into the station wall. Commander Madeleine Powers approached Lave station, aiming to drop out of supercruise as close as possible. Her hold was filled with rare alien eggs found on the edges of space, a promise of life in luxury. “Disengaging” – only seconds to the sanctuary beyond the entrance grills. On her vision’s edge a dark insectoid shape emerged from sparkling clouds, big enough to block out half of the sun. A green beam shot from the front of the structure directly at Lave. Just through the blast doors she saw the back half of the station already starting to drift off into space. The Orca gently lifted from the launch pad and began it’s slow, graceful glid towards the starport exit. She entered the viewing lounge, filled with hundreds of guests gazing out. Nodding to the technician she cleared her throat, announcing her presence. Her voice was amplified throughout the lounge. The words edged around gritted teeth, rasping their way into the control room. The ships captian stabbed his finger down on the send button. Submit docking request. A viper swooped past the stationary Panther, vanishing inside the station. You want to be one of the elite few, yes? Then keep climbing. Forget we’re only one metre away from the void. We got RemLocks anyway. Ah, here it is. The plaque. So few know about; less get to see it. Well done, you made it. You’re one of us now. See, proof this station was the first. She’s the oldest, the prototype – and still turning thanks to us maintenance crews. “Lave” – ha! Reverse the letters. Short for ‘evaluation’. When she creaks we talk to her, calm her. Some call her ‘Val’, some ‘Eve’. Yep, she was the first alright. The controller groaned when he heard the explosion. Faulcon_de_Lacy had a deal with Lave Academy to provide as many free Sidewinders to students as they needed. This new lot of recruits took full advantage. He watched another Sidewinder dodge the hull remnants and silently pass through the docking slot. He fingered his trigger muttering to himself “were you too distracted by that firework display to remember docking procedure?”. It’s a hot day in Lave station, business had been brisk and the air scrubbers were still only on half power. The heat exchangers just couldn’t keep up with the thermal energy this number of ships produced, as for the fly boys who think it is fun to boost out of the station it all just add to the heat. He watches as a sidewinder emerges from the hanger, leaves the pad, arc’s and crashes into the opposite wall of the station. “Why have rotational correction buttons anyway” he thought as he went back to his cold beer. This entry, if “But its a dry heat” is its title, is only 98 words. Mark lay there watching the stars that were Lave stations landing pad lights on the opposite side of the station twinkle, mind drifts off to younger happier days. School was fun, carefree although now he wished he had listened more. What was that calculation, terminal velocity, mass acceleration due to gravity. Now he knew the station had reduced gravity, was the air density the same as a planet? What speed had he got to? but the final question that passed through his mind was why are there no barriers around the landing pads. Mark blacked out for the last time. 30 years ago I sat on pad 32 in Lave Station, awaiting clearance to launch for the first time as a qualified pilot. Quite why I thought hitting boost and corkscrewing out the letterbox was a good idea escapes me now. I did end up with a plaque. Right above where they cut my escape capsule out of the station wall. The story is Lave Station got upgraded to an Orbis Station following the Revolution, some sort or reward or something. See, we were shipping Irukaman Giant Snails, 456 tonnes of the buggers, and there was an issue with the pods and they kinda turned to mush. Nasty, stinking, vomit inducing mush. We were supposed to flush them into the Station’s Effluent System, but Dave, well, Dave might have been a bit drunk. Seems you can’t clean snail mush out of the Environmental System of a Station. Who knew? Still, got you a nice new one eh? Karen rolled over, a soft moan escaping her lips. “I’ll never go back,” she murmured to herself. One month ago, smuggling the illegal cargo was the toughest, most intense thing she’d done. But it was lacking something, so she’d stowed it away in a locked space in her cabin on Lave Station, one of the oldest Corolis stations in use. She scoured dozens of systems before finally finding the right part. Her newly modified android sat up and asked if she needed a drink, or just to snuggle. If you have ever visited Lave Station, you have probably also encountered members of one of the Old Worlds’ most curious cults – likely without noticing. While other stations are maintained by hired contractors or military engineers, the “Lavean Brotherhood of Engineers” is a religious order built around the belief that Lave Station will play a pivotal role in saving humankind during a future cataclysmic event. The brotherhood cares little for politics; keeping the station – which members of the order are symbolically married to at initiation – running is its holy duty. Leaders of the cult claim to be able to tune in to the station’s “spirit”. Your entry is actually 115 words long and needs to be 100 words to be a valid drabble. Chris, Lave station’s head of entertainment, despite a valiant effort, failed to hide his shock at the whispered request the customer before him had made; a man mostly hidden behind a heavy jacket with the collar pulled up, a wide brimmed hat pulled low and oversized sunglasses. A disguise, as obvious as it was ineffectual – serving to make him more distinctive, not less. The silence between them began to stretch, the customer shuffled nervously. An answer was required. Jack moved through the bowels of Lave Station One. Some idiot had crashed into its’ back on a training run and gotten stuck, not bounced or exploded as usual. In his pressure suit he inspected the collapsed part of the structure from the inside. A straight metal beam looked strangely out of place in the twisted wreckage. A plaque came into view: “Smithonian Institute Loan, year 2752. A western frontier’s railway track dated 1823 to commemorate new human expansion.”. “Final frontier, alright” he thought, following the line of the historic track through the sidewinder’s canopy, cockpit seat and cabin wall. Oh Lave station, you are many things to many people. A jewel crossing the night sky. A gateway to the stars. A destination and welcome sight to a weary traveller. A symbol of strength and security in a galaxy brimming with danger. You are a place of work for some and a place of commerce for others. And for a few, those lucky, lucky few, you are that most important thing; a home. For me, for tonight, you are a prison. But my love for you remains true. Oh Lave station, you are many things to many people. A jewel crossing the night sky. A gateway to the stars. A destination and welcome sight to a weary traveller. A symbol of strength and security in a galaxy brimming with danger. You are a place of work for some and a place of commerce for others. And for those lucky few, you are that most important thing; a home. For me, for tonight, you are none of these things. But my love for you is undiminished. Unfortunately despite your edit this one is only 99 words long! You’ve got until later this evening to make changes, otherwise I’m afraid it can’t be included for judging. “Kaze-no-Uta” settled onto pad 18 in Lave station. Finally! Mankind’s second home, site of the original Elite Pilots’ Academy. Dar’koba disembarked, locked his ship, passed through the formalities and entered the station proper. The sights around him were somehow familiar but, at the same time, strange. He intuitively knew the layout of corridors, passageways and open spaces, but the colours were unexpected, a constant surprise, signs of age here and there and the occasional artwork, hitherto seen only in videozines. Despite this being his first and only real visit to Lave, there was a persuasive, all-pervading sense of coming home. blood’ll be shed, and metal twisted bent. sing always of their rivals’ malcontent. the Cobra’s madrigal of grief and blame. with silence, now that Eagle’s in the choir. For what but birds can save us, Lave, from venom? Lizards have no place among the heavens. Forgot to put the title on – should be “The Freagle’s Sonnet”. He knew they’d eventually turn up at Lave. Eventually, everybody did. Over the years he’d managed to trace what had happened to his parents and their ship. He’d found the corrupt industrialist who had paid to have them “removed” and their ship “commandeered” in order to use its advanced technologies for his own profit. The industrialist’s last words were to name the mercenaries he’d hired to do the job. Dar’koba didn’t hurt him again – just let him die in his own filth. Dar’koba studied incoming traffic patiently, waiting to fulfil his mission. He knew they’d eventually turn up. Everybody did. A vessel entered Lave station and settled in bay 23. The radically modified ship was unmistakably recognisable to Dar’koba. They’d arrived! After extracting all valuable parts, their ‘patron’ had given the remains of the ship as part payment to the mercenaries. Dar’koba used the next two cycles to cautiously approach them, commenting on their remarkable ship, asking them what they did for a living. Finally, he asked them if they were interested in some work. They couldn’t refuse the sum offered, half in advance. They took the bait. Some time later just one, a Cobra, returned. I’m afraid this entry is 102 words long, you need to get some editing done. At risk of coming over stupid (I’ve not been well lately ;-)), how do I edit the entry? Under your username there’s the date, at the end of that line it should say ‘Edit’ in brackets. Sorry, Lisa. It might be this old rubber band powered lap-top, or the old XP system, but (edit) is not showing anywhere. Nor does anywhere light up with the cursor, except for the ‘reply’ line. Tell you what, just tell me what you want to change in a comment and I’ll sort it for you. I’ll buy you dinner and a drink at the Thargoid and Fer-de-Lance if you do this for me. The ship reverted to normal space. Its hull a patchwork of dents, scars and flaked paint. In the cockpit, its two crew fared little better. Unwashed, unshaven, gaunt and pale, despite the proximity of the red star. “So, now do you want to tell me why we came all the way out here?” the first slumped in his chair. The second flipped a switch and the speakers hissed and crackled for a moment. Professor Corinthian Plynth, a renowned philanthropist and charitable benefactor living on Stillman Station in the Baxbakeris System, had made millions carefully brokering precious metals deals, gaining a widespread reputation as an astute and trustworthy business man. His word was better regarded by those he dealt with, than an Imperial decree. Crippled in youth, his generosity led from his own inability to repay a debt of kindness to a neighbour who, returning from the liberation of far flung Lave, salvaged a set of motorised leg braces which had so profoundly improved Sebastian’s life. He often wondered about their previous owner’s life. “Don’t look up” I whisper, head reeling from the oppressive expanse of Lave dock radiating down on me. Fern seeing me off was great but “have another brandy” wasn’t. Clutching my boarding card tighter I gulp as the tarmac drifts momentarily under my unsteady feet. Today this coriolis and I part ways, tomorrow who knows where I’ll be. “Wha’ d’ya want?” I hear a docking official growl. “My cabin!” I retort showing my ticket. “Stop right there!” the Alliance recruitment agent barked. Gruffly, almost growling, the portly station chef replied in his lilting brogue “Watch yer tone laddie. Ave been waiting in line, am next”. Life here’s not bad. There’s good living, fantastic views, prime real estate, even enlightened neighbours next door. But this daily commute, I don’t know if I can put up with it much longer. Sharing this enclosed space every morning, I mean urgh! And the nausea. I can only avoiding thinking about that as our weight diminishes by watching this space fill up with Lave residents who just get poorer and smellier the closer we get to the station’s core. Maybe soon I’ll get promoted, work “up top” on the station’s prestigious office level and never take the elevator ever again! Many speak of the fabled Lave Station with such magnificent prose that the blessed angels, weep at their own drabness by comparison. Being neither wordsmith nor student of academe, I hesitate before adding my tale to this august tome. However, for posterity be it known that when space-bound for the first time, I first beheld it’s bejewelled majesty spinning in the heavens against the twinkling midnight gossamer of space, my heart so filled with joy and pride that I could but silently weep at the spectacle. From that moment, where ‘ere I travel, know that my heart is forever thine. Surfing the envelope six, rebels minding, my rear view. Short tanking in range, jump charging too. Escape vectoring, a gear shift to a quarter barrel roll banked right. No moon set. No star rise but views darkening. Clusters all behind, sleeves the curving arms ahead now. Third eye peering, not for deep space wanteds or miners sorrow. Bursting forwards, Winder piles into the witch seconds of subspace. It’s counting, and still counting. More. “Power Up” shields, “Readying” fire groups. Been caught thus before. The jump hurls, hurtling by a pairing star. Glarish and fading, the curtain, to five Thargoid Armadas. There seem to be quite a few people having problems with editing. Glad it’s not only me. Any idea what the cause is? It’s a hot day in Lave station, business had been brisk and the air scrubbers were still only running on half power. The heat exchangers just couldn’t keep up with the thermal energy this number of ships produced, as for the fly boys who think it is fun to boost out of the station it all just add to the heat. He watches as a sidewinder emerges from the hanger, leaves the pad, arc’s and crashes into the opposite wall of the station. “Why have rotational correction disable toggles anyway” he thought as he went back to his cold beer. So what became of “Drabbles will be read out by our own Grant “Psykokow! on the “Abrakadrabble Show” after the competition closes.” –> is that in episode 51? Now that the winner has been announced the other entries will get read out as part of the Abraka Drabble Show, however this is separate from the normal Lave Radio show rotation and handled by Grant. We will of course link to the readings as soon as they’ve been published.